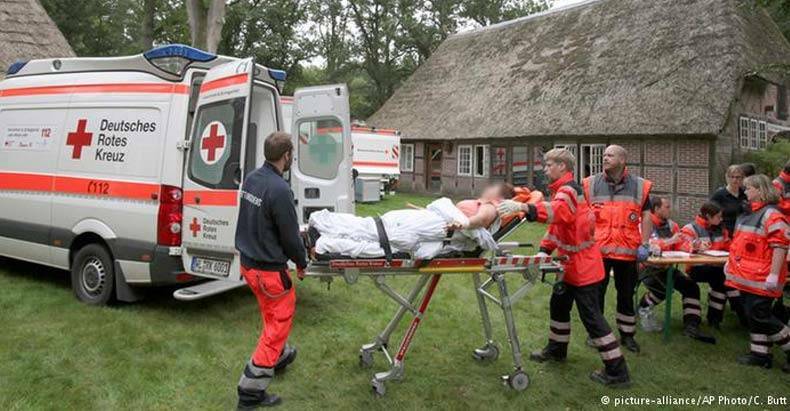 It was reported last week that holistic doctors meeting at a conference in northern Germany were poisoned and taken to the hospital. It was said that 30 different doctors, aged 25 to 55 were poisoned with a psychoactive drug at the conference. During the conference, people began staggering and complaining of cramps, while others had more severe reactions and strong hallucinations. 15 ambulances, a helicopter and some 160 rescue personnel were called to the scene to rush the doctors to the hospital. Fire service spokesman Mathias Köhlbrandt told NDR that he had never experienced such as situation. “Men and women lay with cramps in the garden and in front of the building,” he said, adding they did not seem to have knowingly taken a drug. Some were suffering delusions and even psychoses, NDR reported. Some patients were administered sedatives en route to hospital, said the emergency response physician who headed the rescue operation, Dr. Kai Rathjen. The Associated Press has reported that they were drugged with amphetamines, however, the specific substance that was identified was 2C-E, a strong psychedelic research chemical that is officially listed as an amphetamine but is far more complicated. 2C-E is a powerful, violent and difficult to control psychedelic that is known on the street as a dirty version of LSD. While 2C-E may carry some of the visual qualities that LSD has, it takes way longer to wear off and has lasting effects on the body. LSD by comparison has very little if any lasting physical effects. 2C-E can also be way more powerful in low doses and is known to cause physical discomfort in many cases. Authorities are unsure who poisoned the doctors or how the drug was administered, although it is assumed that it was placed in the food or drinks at the conference. “The questioning begins as soon as the persons are coherent and their statements are useable,” a police representative told DPA. As we have been reporting recently in the US, things have been dangerous for holistic doctors in the US, as many have been turning up dead of unnatural causes, and in suspicious circumstances.